Eratosthenes is a relatively deep lunar impact crater that lies on the boundary between the Mare Imbrium and Sinus Aestuum maria regions. It forms the western terminus of the Montes Apenninus mountain range. The crater has a well-defined circular rim, terraced inner wall, central mountain peaks, an irregular floor, and an outer rampart of ejecta. It lacks a ray system of its own, but is overlaid by rays from the Copernicus crater to the south-west. The Eratosthenian period in the lunar geologic timescale is named after this crater. The crater is believed to have been formed about 3.2 billion years ago, defining the start of this era. At low sun-angles this crater is prominent due to the shadow cast by the rim. When the sun is directly overhead, however, Eratosthenes visually blends into the surroundings, and it becomes more difficult for an observer to locate it. The rays from the Copernicus crater lie across this area, and the higher albedo of these rays serves as a form of camouflage. In 1924, William H. Pickering noted dark patches in the crater that varied in a regular manner over each lunar day. He put forward the speculative idea that these patches appeared to migrate across the surface, suggestive of herds of small life forms. The idea received a degree of attention primarily due to Pickering's reputation. 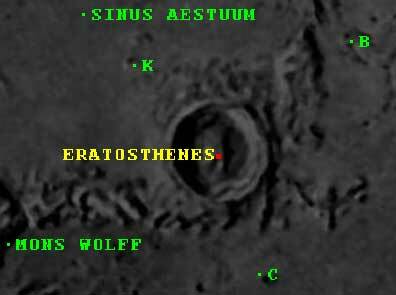 By convention these features are identified on lunar maps by placing the letter on the side of the crater mid-point that is closest to Eratosthenes crater. "Ancient Greeks on the Moon"